Your builder has incorporated into your new home the innovative industry leading Wesure Support Column as part of the floor and/or ceiling systems. These columns support the beams that in turn support the joists of your floor and ceiling. The Wesure Column is completely and properly engineered so that materials and manufacturing meet or exceed the National Building Code and are also certified by the Canadian Welding Bureau. As per the Load Specifications Table, it is designed to support the loads that are transferred through the constructed systems (walls, floors etc.) to these beams. In the unlikely event of a problem, Wesure shall be given a reasonable opportunity to inspect the situation on site, and if caused by a manufacturing or material defect in the column, the problem will be rectified promptly. 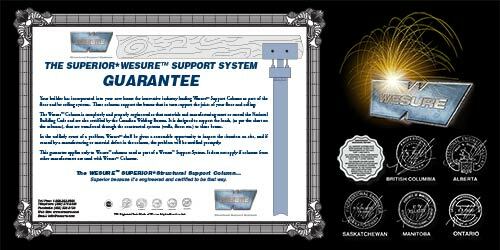 This guarantee applies only to Wesure columns used as part of a Wesure Support System. It does not apply if columns from other manufacturers are used with Wesure columns. As required by the National Building Code and as a prerequisite to Engineer Certification. Wesure is committed to manufacturing excellence.